2014 marked the inaugural year for InterExchange's cultural activities competition: InterExplorer! Hundreds of J-1 cultural exchange participants on InterExchange programs competed by sharing photos and videos from their time in the USA. The more photos and videos shared, the more points earned. InterExplorers earned points for going to American museums, national parks and sporting events, eating American food and learning about the United States, its history and its people. At the end of the contest, all points were tallied and a winner was chosen. And the winner was… Sigolene Jomain from Career Training USA! Sigolene was rewarded for her exceptional engagement in cultural exchange with a hosted trip to New York City. Other active InterExplorers earned points towards prizes like Starbucks gift cards and Amazon.com gift certificates. Great news: the InterExplorer competition is taking place right now! If you are a current participant, learn more and sign up, and start taking pictures to earn points and win prizes! 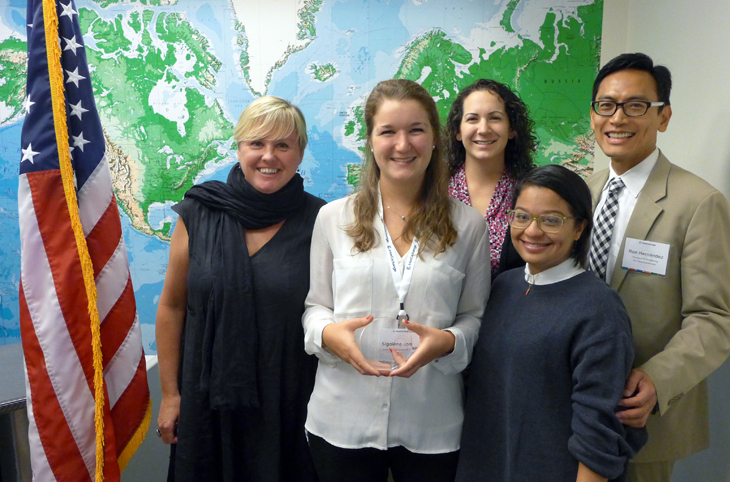 Also check out this video from Robin Lerner, Deputy Assistant Secretary for Private Sector Exchange at the U.S. Department of State's Bureau of Educational and Cultural Affairs, congratulating InterExchange's inaugural winners of InterExplorer.